These are a great alternative to the butter and sugar laden classic. Chia seeds are awesome – packed full of omega 3, antioxidants and minerals, plus they are great for controlling blood sugar level. Mash the bananas with a fork and mix thoroughly with the coconut oïl in a big bowl. Roughly chop the dried apricots then stir them into the banana/coconut oïl mixutre along with the ginger, oats, chia and rice syrup. 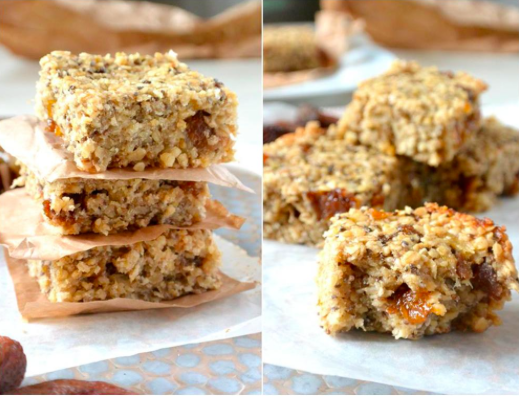 When all the ingredients are combined, line a small baking tray with greaseproof paper and pour in the flapjack mix. Spread it evenly so that the flapjack is about an inch thick, then bake in the oven for 30-35 minutes. I prefer flapjacks to be soft and chewy, but if you prefer them a bit firmer then cook then for another 5-10 minutes, watching carefully that the top doesn’t burn.